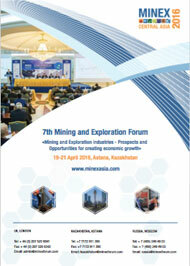 MINEX Central Asia 2016 Forum Technical Committee calls on national and international mining companies, analysts, investors, technological companies and government authorities to submit before 1 March 2016 abstracts to be considered for presentation at the Forum in Astana from 19 to 21 April 2016. The Forum provides a powerful international platform to companies, policy makers, international investor and experts for presenting business strategies, new technologies, investment projects, case studies and also for holding polemic discussions with the stakeholder groups. Over 70 presentations and reports were presented at the previous Forum in 2015.